On February 7th, as the East Coast prepared for the Blizzard of 2013, FCSLA's newest branch S-628 celebrated its official opening in Pittsburgh, PA! Members arrived at the restaurant Bravo! in Robinson Township and were greeted by Agent Bob Lauro and Office Manager Geno Polis. FSCLA was represented by National Sales Manager Patrick Braun, Regional Sales Manager Al Heiles and Fraternal & Youth Director Kelly Shedlock. 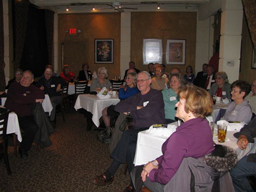 There were 30 attendees for the inaugural festivities. The evening began with prayer led by Deacon Heiles. 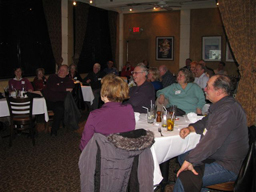 After dinner, Kelly Shedlock presented an informative yet fun presentation. 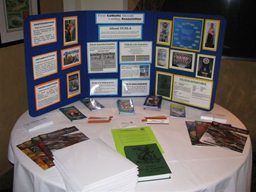 It included a Power Point Video showing photos, facts and the vision and mission of FCSLA. A question & answer session followed the presentation. District Vice President Jerry LaFrankie and his wife Monica were also in attendance to welcome the new members. Jerry spoke to those in attendance about the Pittsburgh District and how it is beneficial for the branch and its members to become part of the district. Patrick Braun and Al Heiles each said a few words welcoming the newest FCSLA members. Bea & Ed Kuchta were nominated as the first branch officers of S-628. The attendees accepted the nomination. Congratulations and Thank You to Bea & Ed! FCSLA & Branch S-628 are very lucky to have you as branch officers. The evening concluded with a raffle of various prizes. Welcome to the FCSLA Family Branch S-628!